A few months ago, I had a reader email asking me what my favorite children’s books were. I loved this question and the more I thought about it, the more my book list grew! I have always done a lot of reading with my kiddos and am so happy to say that now that they are old enough to do some reading of their own, they enjoy it! 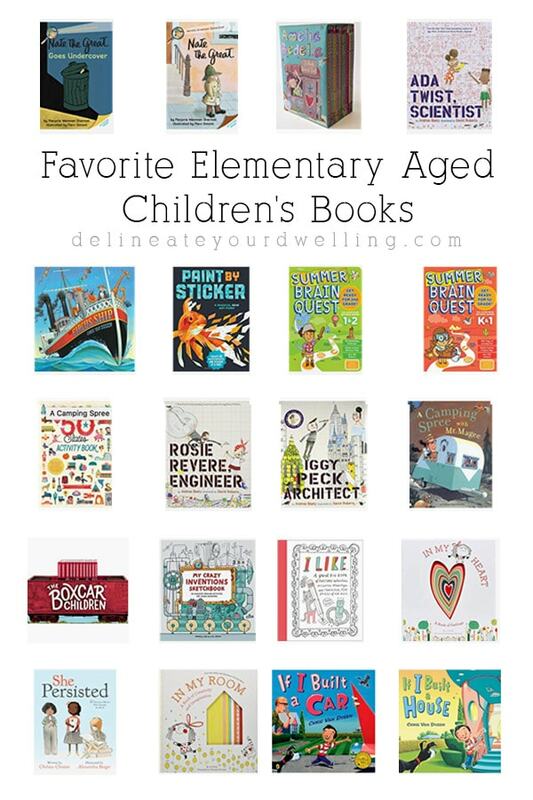 Today, I am sharing my Favorite Elementary Aged Children’s Books. Today’s list of book are my favorite Elementary aged books because that is where my kids are currently. But I think I will share some of the books we loved in earlier years in another post or two. My daughter is into small chapter books in a big way. But she also loves books full of imagination and curiosity. Any book I find that encourages a brave creative spirit, I know she will love. That’s why she adores Rosie Revere, Engineer. She tries to recreate some of Rosie’s inventions… except I won’t go buy her a propeller much to her dismay – HA. My son is into all things adventurous, imaginative and boy. I have adored all the Chris Van Dussen books, “If I built a car” “If I built a house” and “A Camping Spree with Mr. Magee”. We love all his books. They are fun to read and such fun illustrations. During the summer time, we have been going through these awesome Summer Brain Quest books and I have LOVED them. And even more importantly, my kiddos have LOVED doing them. We typically put on a timer for about 15 to 20 minutes and work on their grade appropriate books. Their favorite part is that after completing a page, they put a sticker along a map to show their progression. Okay, now share all of your elementary aged books in the comments below!